← At what speed do you read? Mother Earth Father Sky is the first book in a trilogy that takes us into the lives of an ancient North American people in Alaska. If that sounds boring, don’t be fooled. To be honest, I hardly know what to say about this book. At the writing of this review, having just finished reading it I’m barely back to the here-and-now, and the story of Chagak is still fresh in my mind. To say that Sue Harrison wrote an amazing prehistoric fiction novel scarcely describes what she masterfully accomplished. Over the course of nine years she studied, researched and lived in her creative mind the tale of a long ago culture in Alaska, focusing on one Aleut woman’s struggle to survive and overcome a very harsh reality. That woman, Chagak, lived in a primitive time consisting of warrior tribes, legends, crude customs, myths, and magic, but also love, family ties, and community. The author made it all come alive through the power of the written word in a very easy-to-read style. I was held from the beginning of this book to its last page – left wanting to read more about the people I had come to know. This bestselling novel is not newly released but was published in 1990. I was fortunate to be gifted a copy and I’m so glad to have received it. If you come across Mother Earth Father Sky and you are not offended by the cruel reality and graphic descriptions of the belief system of prehistoric man, then do grab the opportunity to read this book. 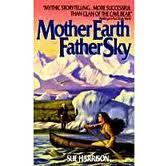 You can find Mother Earth Father Sky listed on my BUY THE BOOK! page. This entry was posted in Mostly About Reading, Reviews & Interviews and tagged Alaska, author, bestselling author, Book review, Doubleday, fiction, international bestseller, Mother Earth Father Sky, prehistoric fiction, Sue Harrison, trilogy. Bookmark the permalink. Thank you so much, Lynn, for running this review again. I’m excited to have the interview be posted on your blog! I can’t wait to give away one of my books to one of your readers! I’m excited, too! 🙂 Thanks for the opportunity to do this, Sue. Yes, Erik, this is an adult book that I think your mom would enjoy.